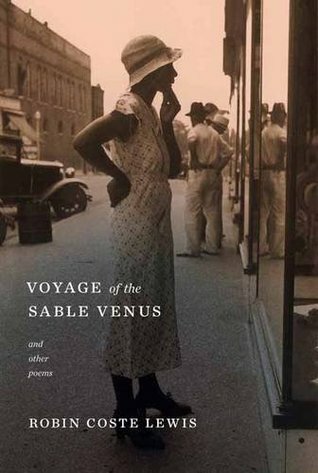 Robi n Coste Lewis’s National Book Award-winning Voyage of the Sable Venus and Other Poems is a powerful collection that beautifully blends the personal and the political. The book is organized around the central section from which the book takes its title, and the poems in this portion of the book reflect a remarkable creative concept from Lewis. As she explains in the introduction to this section, every poem that follows is comprised entirely of “the titles, catalog entries, and exhibit descriptions of Western art objects in which a black female figure is present.” The oldest examples date back 38,000 BCE. No title was altered or fragmented. Lewis additionally added in titles of artworks by black women, whether they included black female figures or not. Only one title was ever repeated. Lewis takes these titles and descriptions and assembles them into poems walking us through the history and experience of black women, with emphasis on black women in America. At times rapturous but most often painful, these poems provide a wholly unique and poignant testimony to the way the world has viewed black people and especially black women throughout history. This section is bracketed by two series of poems that are wholly personal, showing us Lewis’s own experiences as a black woman in an America still struggling with its racist past and present, and also includes poems about motherhood, sexual abuse, identity, and the beauty of being alive. Consistent with the title section’s exploration of black female incarnation, these framing sections play on the theme of embodiment, using this as a lens to navigate its other subjects. In the longer early poem “On the Road to Sri Bhuvaneshwari” Lewis tells of a trip on which she led students to India (she has an MTS in Sanskrit and comparative religion from Harvard) to see a temple for the titular Hindu goddess. The poem works as a beautiful travelogue to a foreign land but also as the testimony of a pilgrimage of identity, one that extended well before and after the trip. In one particularly moving portion of the poem her party witnesses the birth of a buffalo’s stillborn calf. The owners of the buffalo herd, which had stalled the progress of the bus Lewis and her party were on late at night, were wealthy property owners rather than the poor farmers her students expected, the women adorned in diamonds and gold. The scene of the cattle in the roadway at night, the calf born dead in the headlights, the herders subduing the mother so she didn’t panic and flee, all presented with Lewis’s patient insight is surreal and yet imbued with empathy. The spiritual (sacred) feminine is reflected in such divergent but harmonious images as the goddess herself, the rich herder women, the buffalo mother, the dead calf, and Lewis herself. Lewis does a remarkable job throughout the collection of blending beauty and pain, presenting both as part of the same life without either canceling out the other, though the pain presented is certainly profound. Most of the time Lewis avoids tackling racism in any rhetorical way, choosing instead to allow her own experience plainly offered to illustrate broader truths. She finds the frayed edges of our country’s ingrained racism and tugs at the loose strings. In this way, each small moment can be seen as the damaging and mournful thing it is instead of getting lost in a larger conversation. This is similar to the way Claudie Rankine approached the racist microaggressions of her daily life in her lauded 2014 collection Citizen: an American Lyric, though Lewis approaches her topic from a more historical and personal-historical perspective rather than with the urgent immediacy employed by Rankine. The poem that best epitomizes the book’s blend of poetic memoir and broader commentary of the black American experience of racism is “Frame”. The poem shares Lewis’s memories of growing up, and for most of the poem’s four pages these memories are pleasant, though fear and hurt singe the edges as post-Civil Rights movement racism still informs many of these recollections. As the poem progresses however, these memories become darker and bloodier as the poet as a young woman becomes more and more aware of the limits a white society tries to place on her and other blacks. The poem ends with Lewis’s adolescent discovery while browsing her history textbooks there were only a few narratives available for a black person to be remembered for: a leader like Martin Luther King triumphant for a short time, that same leader martyred in a pool of blood, a slave toiling away for white masters during much of America’s history, or a lynched body giving grim testimony to the racism that didn’t leave our shores when slavery ended. It was a harsh truth, and one she fought to overcome. “You gave it to me–a fresh, sharp walnut–pungent and coy. If this book is part of her answer, it was worth waiting for. Voyage of the Sable Venus and Other Poems is available now at GPL.